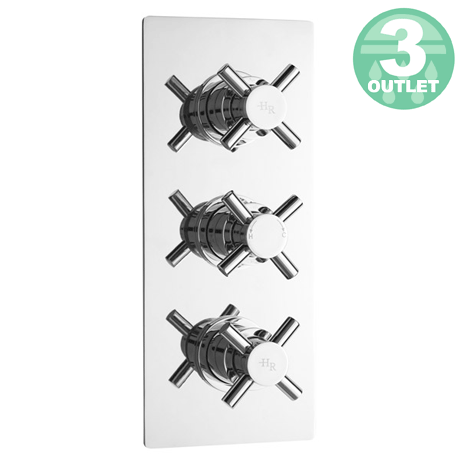 The Hudson Reed Kristal triple concealed thermostatic shower valve with diverter features a clean, minimalist body with a symmetrical crosshead handle design, to provide a stylish yet functional range for any bathroom. The concealing plate can be installed vertically or horizontally to fit your bathroom and is available with a variety of kit options. Suitable for all types of plumbing systems. Operates two shower accessories separately or simultaneously and diverts to a third option: fixed head & slide rail kit, fixed head & body jets or slide rail kit & body jets with option to divert to a freeflow bath filler.